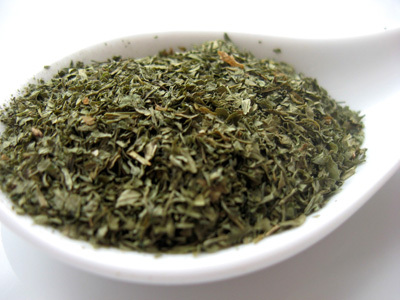 Chervil is a delicate annual herb related to parsley. It is commonly used to season mild-flavored dishes and is a constituent of the French herb mixture. Chervil is used, particularly in France, to season poultry, seafood, young spring vegetables (such as carrots), soups, and sauces. More delicate than parsley, it has a faint taste of liquorice or aniseed.Chervil is one of the four traditional French fines herbs, along with tarragon, chives, and parsley, which are essential to French cooking.